The latest World of Warcraft expansion, Warlords of Draenor, hasn't dropped yet. That hasn't stopped Chinese gamers from getting excited over it. To help the time go by faster, Sina Weibo's official WoW account started a cosplay contest, and some of the entries they got were just gold. Gold. On Friday the 26th, the Sina World of WarCraft weibo page posted a contest that would accept entries till October 7. 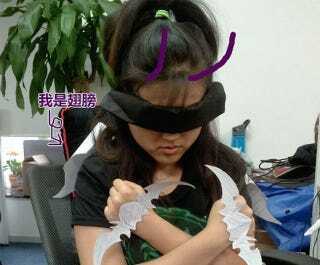 During that time, netizens who post a photo of themselves cosplaying as a character from WoW with the hashtag #有cos有内测# (Have Cos have beta key) get a chance to earn early access to the upcoming expansion. In the last two days, the hashtag has generated quite a lot of buzz for WoW. According to Sina weibo's hashtag counter, the topic has reached over 8 million users. Sina has received a lot of entries. Perhaps to help the event reach more people, Sina has gathered the 43 best cosplays submitted so far. Of those 43, we've picked the 14 best ones for your viewing pleasure. I'm not even going to pretend I have any idea what half of these people are trying to cosplay as—some of them aren't even cosplaying, they're just photoshopping. That said, while the costumes might be a bit... weak, the attitude is pretty awesome.